Are you looking for an economic way to suppress your PS90 that doesn't include ATF forms, federal taxes, or cutting down perfectly good barrels? If you are, you are in luck. We have developed and released a PS90 Barrel Shroud that loses the fixed flash suppressor in favor of a 1/2-28 thread to which you can attach any 5.56 (like our Kestrel 5.56) or .22 caliber (like our Kestrel .22) silencer made by any manufacturer rated for the 5.7x28. The PS90 silencer-friendly barrel shroud comes with .625 (the standard thread length for 5.56 silencers). If you are attaching a .22 silencer with .400 thread depth, you may need a few flat washers from your local hardware store. 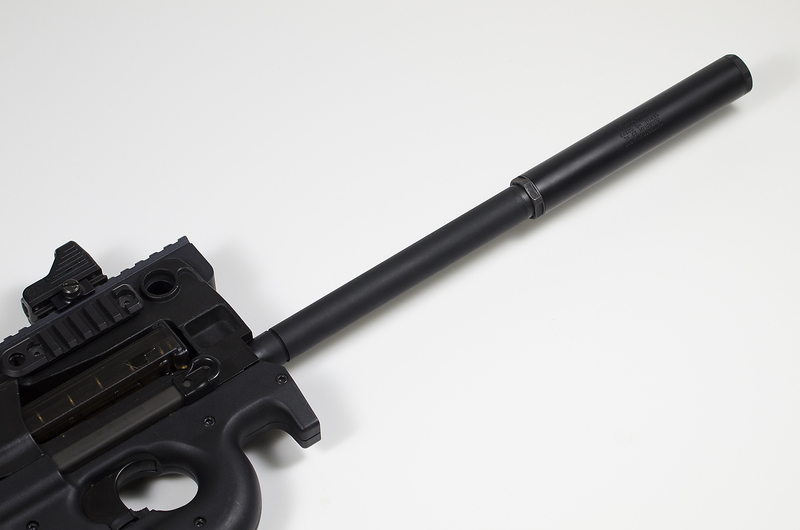 Additional information and installation instructions for the PS90 barrel shroud will be posted soon. Note: In Military Arms Channel's review video for the PS90 shroud, it was stated that Huntertown Arms provides stand off spacers for use with 22 caliber suppressors. This was an error. We do not supply any spacers with the shroud, nor do we currently make any. Your best bet is to get a flat washer from your local hardware store that will reduce the amount of threads to .400.